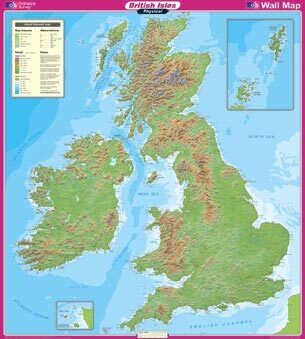 British Isles Physical Wall Map at 1:1,000,000 from the Ordnance Survey, size 93.5 x 104cm ( 3ft 1" x 3ft 5" approx), with a laminated surface which can be written on with suitable marker pens without damaging the map. The map shows the physical geography of Great Britain and Ireland by relief shading and altitude colouring, with numerous spot heights (in metres), plus names of peaks, mountain chains, forests and other natural features, etc. Larger towns are marked, but the map does not show the road network. 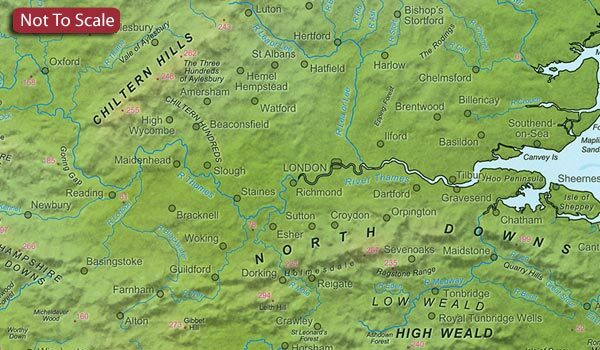 - *laminated* wall maps have a thin layer of plastic usually applied to the printed side only. They can be written on with suitable marker pens without any damage to the map but, unless laminated on both sides, they are not damp-proof. - *encapsulated* wall maps are sealed between two sheets of plastic. They are more rigid and heavier than laminated maps of the same size. They are damp-proof and do not crinkle in humid conditions. Encapsulation gives the map a shiny surface, similar to being displayed behind glass. - *please note:* many publishers and retailers often use these two terms interchangeably. Our map titles and descriptions follow the definitions provided above.